If you love charcoal barbecues for their authentic grill flavours, the Alfred barbecue is what you need. In fact, this charcoal barbecue lets you share meals with family and friends in total simplicity.Thanks to its windbreak, ignition and cooking are fast. The windbreak limits the effect of air flow on the ashes. The cooking grill adjusts to 5 levels to adapt to your needs. It is equipped with two handles for easy handling (height adjustment, grill removal). 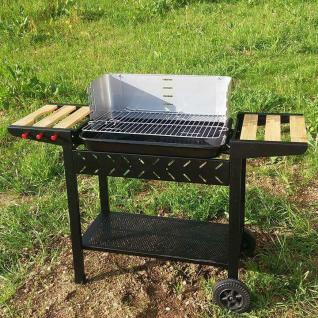 These handles are removable so as not to interfere with the cooking space.This charcoal barbecue has a wooden shelf on each side and a shelf underneath. This is useful for storing dishes, utensils and condiments. One of the shelves has hooks for your tea towels, for example.The Alfred barbecue moves easily thanks to its 2 large wheels and the handle integrated into the side shelf. To guarantee its longevity, the Alfred barbecue is made of steel coated with black heat-resistant paint and the charcoal tank is fully enamelled. Light your charcoal barbecue quickly with the ignition chimney and handle your food with ease with the utensil case. These additional products are not shipped with this barbecue but they are available in the Alice's Garden catalogue.